In the world of finance and investment why are so few women seeking investment for their businesses? Is it because it is so much harder for women to secure investment? Are they daunted by raising finance? Is it because the funders are predominantly men? Or is there another reason? Recent statistics show in respect of tech businesses only 10% of investment goes to female founders, whilst fewer than 15% of European start-ups are founded by women entrepreneurs. So, what is holding us back? I have held and attended many events as both a female entrepreneur and advisor to businesses. I would estimate that less than 5% of the audience are female and less than 1% hosting the talks are women. 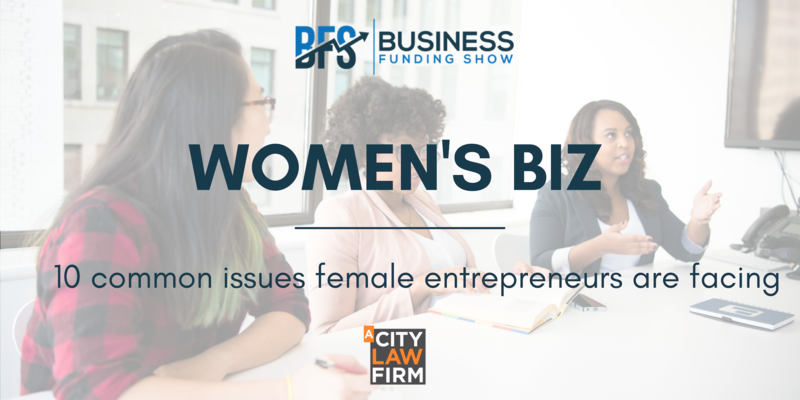 As a strong and successful business owner I would like to change that and see more female founders thrive. So how do we encourage women to disrupt the ever-continuing gender gap? From my own experience in business and those of my clients I have identified a number of mistakes that entrepreneurs of both genders make;perhaps if female founders can overcome these then they can get ahead of their male counter-parts. This is often the first mistake all business owners make. I have seen numerous entrepreneurs rushing into business instead of exercising caution. If an entrepreneur is able to take a calm and rational approach and choose wisely it will set them up in good stead. Choosing the wrong business partner or investor can be costly. In addition to the financial impact, your reputation is at risk. It is so important to have a co-founder’s agreement in place and ensure everyone is working to the same aligned goal. When starting a business, many entrepreneurs forget to have those difficult talks, about exit plans, death, what if you divorce, there are financial struggles, investment and much more. This is especially true if starting a company with friends or family. What happens if someone offers to buy the business or you need an investor? What happens if you want to leave or your partner isn’t pulling their weight? It also makes sure that as you grow you keep discussing the future together. Starting a business means cash flow is often quite tight and business owners will try to juggle multiple people's jobs until they can afford to recruit; some of us also juggle children and childcare arrangement. You may in an effort to save money be tempted to avoid hiring professional advisors. I have also seen owners try and handle aspects of the business they’re not trained in, nor particularly good at! These include legal matters, accounting or branding. It’s easy to think you can do it all but having the right team is paramount to success. Downloading a template and filing accounts can seem straight forward. However, it is later when the mistakes, wrong allocations and missed issues are flagged up that cheap and cheerful templates let you down and ultimately cost you far more money. Whilst you may think you are multitasking and can handle many things, be wise and when you’re not qualified surround yourselves with trusted advisors that can support you. You can then focus on what you are good at,running and growing your business. Securing large established clients and the “lucrative” contracts that come with it is an aspiration many entrepreneurs have. But it can be disastrous to obtain it too early in the journey. Staged careful calculated growth is not a weakness and often ego’s get in the way of a carefully crafted growth plan. Writing a plan, budget and contingency plan can escalate your business not slow it down. One client represented, took on a contract and the extra staff to service this amazing venture, but he had no contingency plan. When completion was pushed back six months meaning he had to fund the staff and office space for an extra six months, without being paid, sadly he couldn't do it and the business folded. Carefully plan the next step up and ensure you have a plan B if things go wrong. When you’rein the position to employ staff, it’s important to keep them motivated andcultivate an environment people want to work in. Flexibility, family values,pay, shares and creativity are all good incentives. Whilst keeping your teamhappy is imperative for productivity, some business owners overlook theimportance of a good employment contract. Bad relationships and access to sensitive material can lead to employees leaving and potentially competing against you. Have water-tight contracts, restrictions and terms of confidentiality in place can prevent anything like this happening. Ensure your processes and policies are consistent and clear; reviewed; monitored and enforced. If some one is accessing your trade secrets unnecessarily ensure you can detect and deny access to minimize potential damage. When an employee leaves these processes will help you control how to stop information leaving with them. If someone is unhappy you can protect your business from reputational and actual damage. Cash flow can cripple the most established businesses. Poor financial management and overspending can have a huge part to play. Make sure your contract terms and invoices are consistent; be clear on your price structures and never procrastinate if you are not paid on time. Train your clients and staff to recoup costs within those agreed guidelines as it’s easy to slip and everyone become comfortable with late payment. Add interest terms to your contract as a deterrent and you then have something to use later to promptly recover unpaid bills. Don’t over extend credit and make sure you know who your offering credit to. In the excitement of building a business, we can sometimes take on clients without real consideration. As hard as it might be to say ‘no’, it’s important to be selective. Take on too large a client you can over extend yourself. Taking on too many clients can have the same effect. What do you want? What can you cope with realistically? Do you have a back-up plan if more is required? My advice is to carry out due diligence and watch for warning signs of them being unable to pay you. If they start bartering too much on fees walk away. If it's outside your comfort zone be clear that you can genuinely service them. If you are investing in several businesses, sharing your time amongst them can be a difficult balance to strike. Entrepreneurs love to overstretch themselves, but it can be detrimental to you, your staff and your business. Alternatively,if you are focused on only one business, don't micro manage staff members as they can lose motivation. Getting the balance is tricky but essential. Work life balance is also key with or without a family never forget what you are doing this for an if you’re not enjoying it or succeeding reevaluate. As we allknow, some things will never go to plan or conclude on the deadlines set.As an entrepreneur, we want to be in control but it’s not always possible andwe have to adjust our expectations. I’ve learnt to be realistic and setachievable goals for me and my team. Otherwise it will seem that you are always winning bronze rather thangold. That said never take no for an answer if one door closes find anotherroute and bash the boundary down. Are you going to sell, take on investors, expand overseas or run the business to passion to your family? Plan your exit early on and make this clear to others. It is absolutely key to achieve this aim, otherwise no one knows the ultimate goal. A business plan and shareholder’s agreement are key to this. In addition, your Wills, mission statements to staff and investors should be clear about your endgame. Not planning this early on means you are now driving the business to an end goal and it prevents people getting on board too. If youdecide to sell the business, it’s important for the brand to stand alonewithout you. No onewants to buy a brand or company whose goodwill and reputation will be lost ifyou walk out the door. Some entrepreneurs think it’s all about ‘them’ but actually, it’s about having a fabulous team who deliver exceptional service. It’s also about owning and protecting your IP be it the design, patent or logo and ensuring this creates goodwill. Investors though look at you and need to see your passion and drive to sell the business but as you grow the business needs to take on its own life too so it acquires value on its own. With all the issues identified above, preparation and due diligence is key. Know what you want, how you want to get there, prepare carefully and exercise caution. A female founder can succeed and obtain investment to grow if they start believing in themselves and with fighting spirit and good advice there are many opportunities out there. As a female founder myself in a sector ( Law), that sees less than 25% females in founder/partner roles I understand how difficult it can seem and how fighting against the tide seems impossible. However, 10 years on my business has gone from strength to strength and my female business clients have also shown great determination and success,which frankly I think we need to shout about to encourage many more women to embrace their business dreams. KarenHolden is a female entrepreneur, the founder of A City Law Firm (ACLF) – anaward-winning, go-to law firm for entrepreneurs, high-net-worth individuals andlarger corporate brands. Wish to meet Karen in person? Come join us at our annual flagship show – Business Funding Show '19, taking place on 21st, Feb at East Wintergarden. It will be a one-stop-shop for all your funding needs! Learn more and secure tickets here.